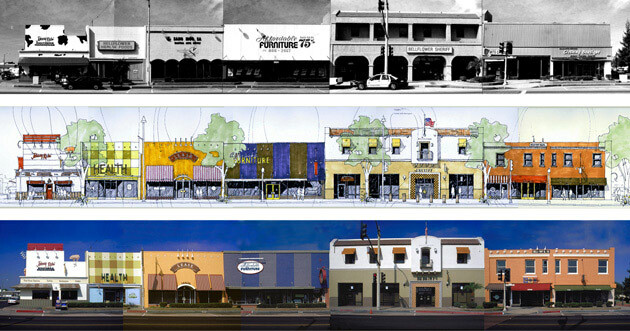 The City of Bellflower initiated the Block Improvement Grant program in order to revitalize this dilapidated streetscape on a major boulevard. The site posed the characteristic challenges of many traditional commercial streets that have become neglected: many rundown and often ordinary buildings, crime and security issues and an accumulation of misguided modernization efforts. Public meetings along with the coordinated efforts of Moule & Polyzoides, City officials, building owners, tenants and other community stakeholders would eventually be fully realized in a design approach that won broad-based support. Selective interventions such as improved signage, lighting and paint imbued the ailing area with restored life. 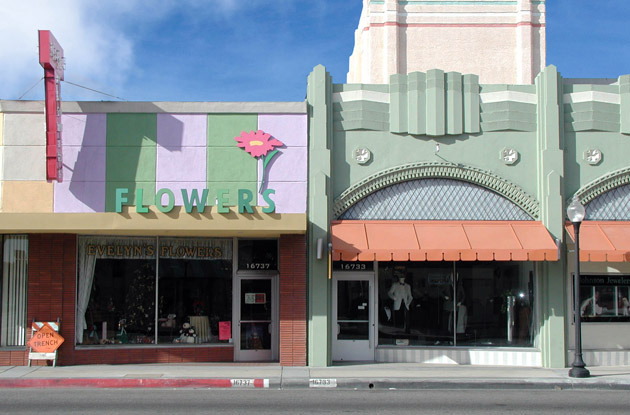 Metal siding that was installed in the 1960s was removed, revealing a beautiful art deco façade from a 1920s-era theater complex. The City’s streetscape program was seamlessly and simultaneously integrated into the project, rejuvenating a cluster of four contiguous buildings adjacent to the rehabilitated block.